The Kansas City Chiefs linebacker was found sleeping in a car outside an apartment ten miles from the home he shared with Kasandra Perkins. 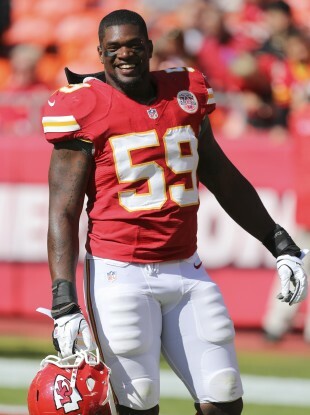 Kansas City Chiefs inside linebacker Jovan Belcher was questioned by police early on Saturday morning. KANSAS CITY CHIEFS linebacker Jovan Belcher told officers who found him sleeping in his car outside an apartment complex hours before he was involved in a murder-suicide that he was there to visit a woman he described as his “girlfriend,” but that she wasn’t home. The apartment complex is about 10 miles from the Kansas City home Belcher shared with 22-year-old Kasandra Perkins, the mother of their 3-month-old daughter Zoey. Belcher shot Perkins at their home Saturday morning before driving to Arrowhead Stadium, where he shot himself at the practice facility’s parking lot, police said. Police responded to a report about 2:50 a.m. Saturday of a man sleeping in his car outside an apartment building, police spokesman Darin Snapp said Tuesday. When police approached the car, Belcher got out of the vehicle and was cooperative, Snapp said. “We ask him ‘Why are you sleeping here?’, and he says he’s there to visit his girlfriend, but she’s not home,” Snapp said. When police determined Belcher didn’t have any outstanding warrants, Snapp said Belcher, 25, made a phone call and a short time later, a woman let Belcher into her building. Police did not question the woman and don’t know who she is, he said. Snapp said that was the last contact police had with Belcher “until his name came up” with the shooting at his home. Witnesses have since told police that Belcher stayed at that apartment until 6:30 a.m., Snapp said. At about 7:50 a.m., police were called to Belcher’s home after he had shot and killed Perkins, whose body was found on the floor of the master bathroom with multiple gunshot wounds, according to a police incident report. Belcher then drove about five miles to Arrowhead Stadium, where he was met by general manager Scott Pioli and coach Romeo Crennel, who Belcher thanked for all they had done for him. When police arrived, Belcher moved behind a vehicle, out of clear view of officers, Snapp said. He said Belcher then knelt down and shot himself once in the head. Snapp said Belcher also used two separate, legally registered handguns in the shootings. Friends have said the relationship between Belcher and Perkins was strained. The couple briefly lived apart recently before getting back together by Thanksgiving, friend Brianne York told The Associated Press. Kansas City Chiefs spokesman Ted Crews said Tuesday he wasn’t aware of what counseling efforts the team may have made for Belcher and Perkins. Belcher played college football at the University of Maine, where he repeatedly was the subject of university police reports. A University of Maine spokeswoman provided the reports to the AP. In April 2006, Belcher punched his fist through a dorm window after becoming upset over a woman, documents said. Also Tuesday, police posted a brief audio recording of some of Saturday morning’s dispatch traffic. In the 1-minute, 41-second audio compilation, a dispatcher is relaying information about the shooting at Belcher’s home. Snapp said that was the only audio police planned to release regarding the shootings. Email “Belcher told cops he was waiting for 'girlfriend' ”. Feedback on “Belcher told cops he was waiting for 'girlfriend' ”.